Thinking of switching up your home’s interior design? Well, your decor options are definitely looking up! A new ceiling can do great things for a room’s ambiance, seriously affecting the overall spaciousness, lighting, and general appearance. In fact, it may even increase the value of your home, if you play your cards right. And perhaps no ceiling option packs as big a punch as a tray ceiling. It adds a sophisticated design element to your home decor while offering a space for a major above-the-head statement piece. Let’s dive into the basics of tray ceiling designs—and what installing one can do for your home’s visual appeal. First thing’s first: we need to talk about what a tray ceiling is, and how it differs from other ceiling types. A tray ceiling, also known as an inverted or recessed ceiling, can be made of almost any material. Their distinguishing feature consists of an inlay, usually rectangular, that sits above the rest of the ceiling. That effect adds architectural interest to an otherwise flat surface space. The border around the raised area is typically covered in trim, although some homeowners choose to skip this element. Typically, homeowners opt for tray ceilings in rooms with very high ceilings—that way, the extra design elements in the trim and inlay don’t clutter or crowd the space. The raised area also provides a spot for unique lighting options. Homeowners often install tube lighting around the edges of the tray, which gives the room below a soft, glowy look. The height of the tray depends on your personal preference. Taller trays with sloped sides dial up the dramatic flair. On the flip side, shorter trays with decorative crown moulding bring out an antique picturesqueness. For a more modern take, try trading in the trim for cleaner lines. Like most things in home decor, customization is the key to this look. In fact, homeowners have found a huge range of different ideas to dress up their tray ceiling decor. What follows are some of the most commonly seen elements. Painted Inlays: Painting a tray ceiling in a contrasting color is probably one of the easiest ways to get this space stand out. In fact, you can use color to your advantage to add dimension to a room. For instance, painting the ceiling tray a darker color than the surrounding space will create the illusion of more space, thus making a tall ceiling appear even higher—and adding an airy ambience to your space. Textural Additions: Rustic elements easily capture that homey feel so sought after in kitchen decor. A stained tongue and groove wooden tray puts the textural diversity of natural wood on display, front and center. For a quaint farmhouse effect, a wooden tray painted in a slate or light blue holds plenty of appeal. Double Trays: In a very high ceiling, a tiered double tray truly draws the eye upwards to a single focal point. This provides a stunning vantage point for a jaw-dropping chandelier, gorgeous mural, or other object of interest. It pairs well with classic, ornate decor, such as Rococo-inspired interiors or Spanish-style Colonial architecture. However, with unexpected paint choices and more modest trim, it can be used in modern spaces as well. Lighting as a Focal Point: Since tray ceilings naturally lead the eye upwards, they make natural candidates for large pendant lights, chandeliers and other decorative lighting. 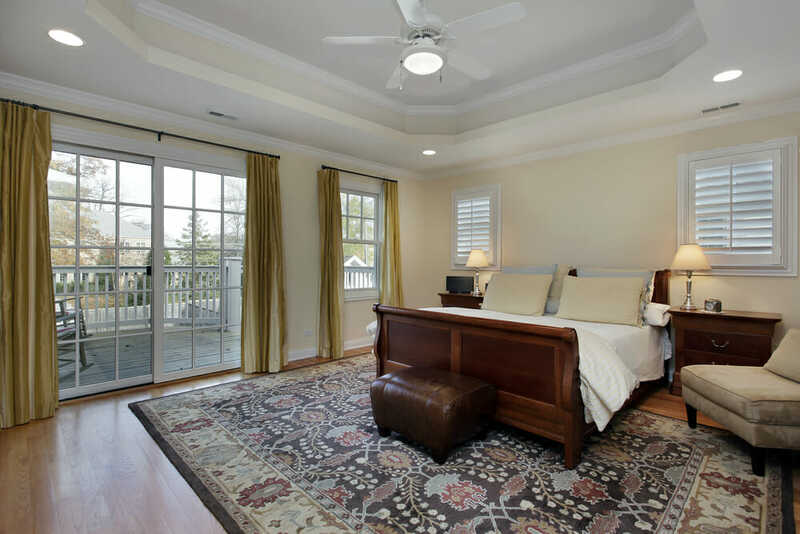 In the bedroom, tray ceilings provide a home for ceiling fans or even recessed can lights—which can be nestled both inside the tray and along the outer edge for additional lighting. Ceiling Murals and Stencils: Another way to show off a tray ceiling is to use its interior as a canvas. Stenciled designs in inviting or bold colors, elaborate murals, and striped slopes are just some of the ways adventurous homeowners choose to show off their custom-built ceilings. Most ceiling work comes off a lot more smoothly when it’s handled by a contractor, but tray ceilings, in particular, are best left to the pros. In fact, installing one can be difficult for even a seasoned professional. For this reason, you can expect to pay more for this project than you might for other ceiling renovations. However, if cost is a concern for you, you may find that you can get this look cheaper in a one-story home or on a second-floor room, or if your ceiling already has sloped scissor trusses. If you want to install lighting to go with your new tray ceiling, expect to pay more to hire an electrician, as well. Overall, tray ceilings add a bit of polish and an exquisite note of architectural interest to a room’s decor. 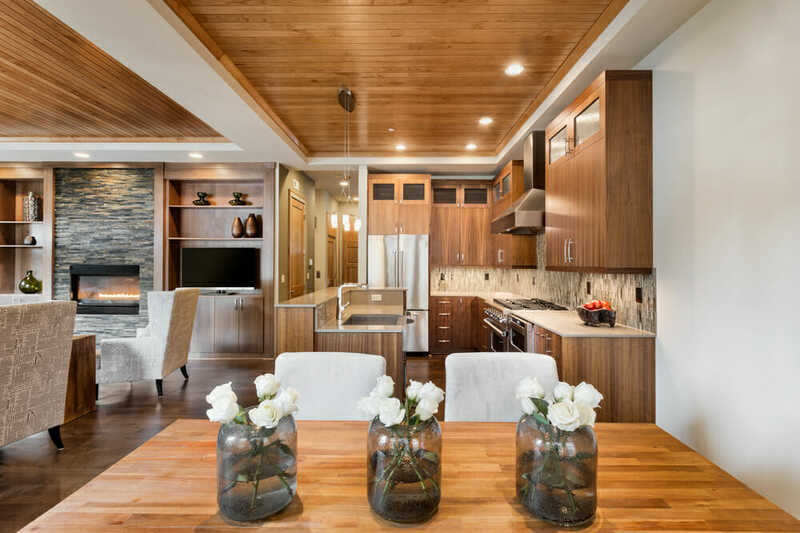 Ceilings have the power to turn an otherwise ordinary kitchen, dining area, or bedroom into a spectacular design statement. With ideas like these, home decor is definitely on the up and up!